We get many requests for individual tickets for one of our 3-hour Docent-Guided Tours of the Collection. This tour includes 2 hours in the Sanfilippo Residence and one hour in the Carousel Pavilion with the Foundation Director as your tour guide. Cost is $25 per guest. Limited tickets available; first come, first served. Tickets only available through The Sanfilippo Foundation Website. 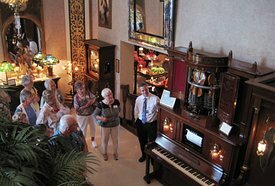 Come hear the story of the family and Collection, demonstrations of a variety of music machines, a mini-concert on the Mighty Wurlitzer and a the history of the items in the Carousel Pavilion. There's a reason many folks have taken this tour more than a few times! It's educational and highly entertaining. Featuring Organist Mr. Dave Wickerham, with Army veteran and Opera Bass-Baritone Mr. William Powers. 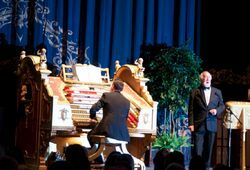 In celebration of all the branches of our military service, this Wurlitzer Concert will feature patriotic and great American song selections on the Mighty Sanfilippo Wurlitzer. Join us as we celebrate Armed Forces Day. Doors open at 1 pm for touring; concert begins at 2:30 pm. The Carousel pavilion will open for one hour after the concert. Special Concert pricing of only $35.00 per person. Limited seating, purchase tickets early. 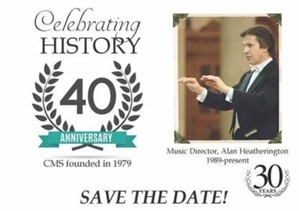 Special, double-anniversary celebration includes Maestro Alan Heatherington's 30th year as music director. House Touring, Gala dinner in the Carousel pavilion with auctions and raffles. Email: info@chicagomastersingers.org or call 877-825-5267 for more information and to purchase tickets. Chicago Master Singers is an auditioned chorus of singers from Chicano and many suburban communities. The chorus has performed sacred choral masterworks in collaboration with professional soloists and orchestras in the Chicago area and on 13 tours in Europe. 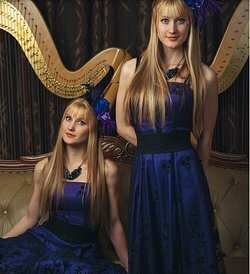 Camille and Kennerly Kitt, known Worldwide as the Harp Twins, come to the Sanfilippo Estate for an exciting concert featuring contemporary rock, metal, and other favorites, as well as original songs on classical and acoustic harps. A dynamic performance is in store along with a fun presentation of growing up identical. The Harp Twins have filmed 7 videos at the Sanfilippo Estate which can be viewed here. Doors open at 6 pm for up to 90-minutes of touring the Collection, followed at 7:30 pm by a 90-minute performance in the theater. After the concert, guests can visit the carousel pavilion where the Harp Twins will offer a Meet & Greet. CDs and other Harp Twins items will be available. Special Concert Pricing on this event is $35.00 per person. We are also asking, if so inclined, that guests bring a non-perishable item for our local Cuba Township Food Pantry. (Items can be dropped off upon arrival). June 15 - The Other 3 Tenors - "Around the World in 80-minutes." Tenors Warren Moulton, Franco Martorana, and Simon Kyung Lee return to Sanfilippo with their trademark humor and song antics to take us on a cosmopolitan journey around the world in smooth tenor voices. This is not you're mother's opera. July 20 - Nathan, Nick, & Zach - "3 Under 33" Organists Nathan Avakian (NY), Nicholas Renkosic (IL), and Zach Frame (WI), each under 33 years of age, share the Sanfilippo Wurlitzer and the stage with solos, duets, & trios. Expect to hear a new generational approach to the theater organ and expect the unexpected in song selections from these bold, young, talented organists. Don't let their ages fool you; these gentleman can perform, and we're letting rock the Big House. August 17 - "Juke Box Saturday Night", with Maestro Dave Wickerham on the Sanfilippo Wurlitzer, and Crooner-extraordinaire Mark Demmin. By popular request, Dave and Mark are reuniting after their hugely successful Christmas show at Sanfilippo to bring you a timeless collection of golden hits from the 1930s through 1960s and beyond. Vintage Voice, Vintage Wurlitzer, Vintage Wickerham: what could be better? September 21 - Tedde Gibson, "Jazz Plus: exploring the wide diaspora of music on the Sanfilippo Wurlitzer." A native of Tacoma, WA, now living in Maryland, Mr. Tedde Gibson specializes in not only classical and theater pipe organ, but jazz and gospel music. Toe-tapping nostalgia and surprises on tap from a uniquely talented organist. This is Mr. Gibson's debut performance at Sanfilippo. Return to this web page often for an update of our events open to the public. You can also join our E-Newsletter List (below) and be among the first to receive notice of all our events, and how to obtain tickets. The Sanfilippo Estate is a private residence not open to the general public except through pre-arranged charity events and pre-arranged group tours of 40 or more guests, and a limited number of corporate events. Interested groups may contact the Foundation Director by email: director@sanfilippofoundation.org for more information. We do not offer the Estate for weddings, wedding related activities, nor children's parties. Special Events (concerts, gala fundraisers) can be arranged for Charity Organizations and Corporate Groups. Email the Sanfilippo Foundation Director: director@sanfilippofoundation.org. Please include a contact phone number. Tour Groups: 3-Hour, Docent-Guided Tours of the Sanfilippo Collection are available for groups of 40 or more. Send an email to: info@sanfilippofoundation.org. Please include the name of your group and a contact phone number. Individuals looking to visit the Estate are encouraged to find a group (such as your local libraries, park districts, senior centers, etc.) who can put together the required minimum for one of our 3-hour Docent-Guided Tours and then have the organization contact the Foundation Director; or you can visit one of the websites of the charities holding events at the Estate (links provided) and obtain tickets to an event listed; or you can attend a Sanfilippo Foundation event -- all are updated regularly on this website. We also encourage individuals to sign up for our E-Newsletter. On occasion, we offer individual tickets to a guided tour to our E-Newsletter subscribers. Our preference for initial contact is by email.